A benefits sanction map of the UK shows how High Peak claimants are being treated with cruelty, according to the charity homeless Crisis – as reported on the BBC News website today. The High Peak is one of worst areas for these punitive sanctions, with 11.4% of claimants having their payments stopped – the 6th worse in the UK! The payments – which can be stopped for four weeks, or as much as three years depending on how many times the rules are broken – have contributed to the ever increasing numbers of people relying on foodbanks and presenting to local authorities and charities in crisis, such as Glossopdale’s Bare Necessities foodbank and the Glossopdale Furniture Project. This simply cannot go on. The High Peak cannot survive another 5 years of Tory-led ideological driven cruelty and cuts. We need change. We need compassion. We must vote for it on 7th May. Friday saw Derbyshire Labour’s Alan Charles elected as the first Police And Crime Commissioner for Derbyshire. I would like to reiterate my sincere congratulations to him and his team on their victory, and equally the victory for the people of Derbyshire:- with their police service now safeguarded from the threat of privatisation. I also know that in Alan we have a vociferous champion for public services in this county, who will fight the proposed reckless government cuts of 20%. Although Alan received this majority, this was on an official turnout of just 14.75% which is extremely disappointing – especially in a mature democracy such as ours. So where does blame lie for this? Squarely at the desks of Theresa May and David Cameron! In the run-up to this PCC election – which cost £1 million here in Derbyshire alone – the government was rightly criticised for not doing enough to publicise these election and for virtually guaranteeing a low turnout by holding ballots in the cold and dark month of November. This, despite stating they wanted independent candidates to have a fighting chance. And worst of all has been its proven incompetence, at best, and maladministration, at worst, epitomised by the £350,000 spent printing Welsh ballot papers in English rather than both English and Welsh. Insufficiently funded, incompetently executed and unpopular with voters. So here’s wishing Alan and all his fellow Commissioners the best of luck in protecting our communities from crime, and from the long cutting tentacles of the Coalition Government. 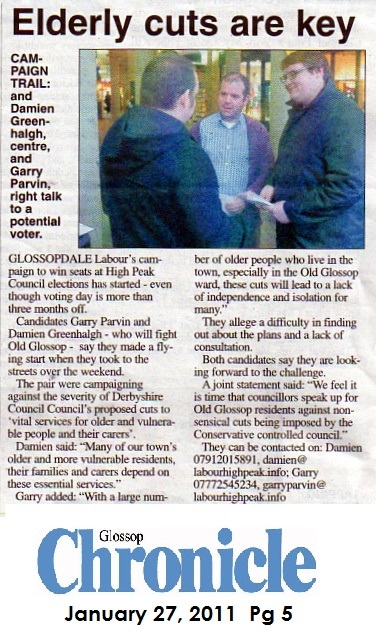 The campaigning of activists, Garry and I against cuts to adult social care was highlighted in both the town’s papers this week. 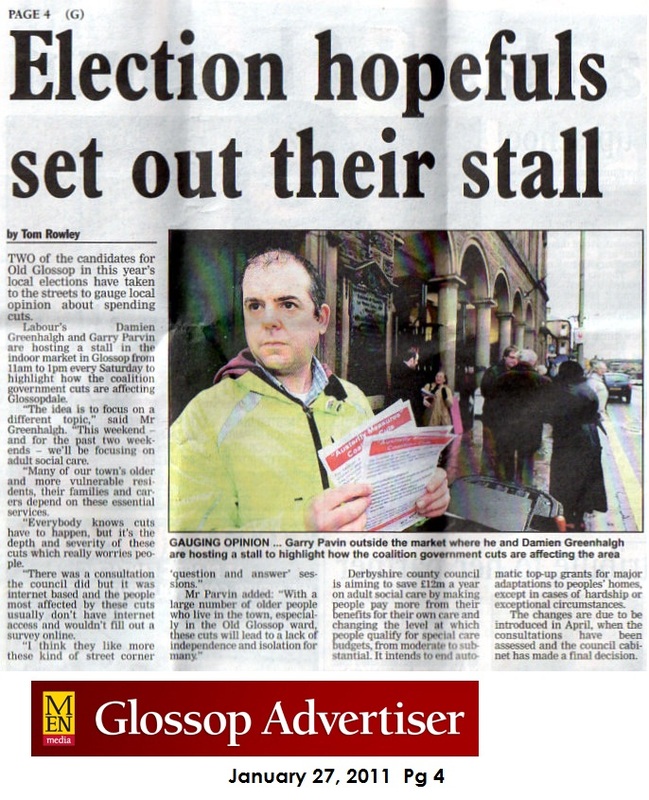 Glossopdale Labour will be holding further street stalls outside the town hall arcade on the High Street into February on Saturday 11am to 1pm. We are very keen to listen to any comments and/or concerns you may have. We, unlike the controlling Conservative group on the Council, feel that its better to chat to you in person rather than relying on gimmicky internet consultations. So pop down and have a chat with one of us!